Hadiza Bala Usman was born on 2nd January 1976 in Zaria Kaduna State, Nigeria. She started her education at Ahmadu Bello University Zaria Staff Primary School and went ahead to complete both her secondary and undergraduate studies at the Ahmadu Bello University campus, Zaria with a BSC in Business Administration from 1996 - 2000. She later obtained an MA in Development Studies from the University of Leeds, United Kingdom in 2008 - 2009. She started her career with Centre for Democratic Development and Research Training [CEDDERT] Zaria, a Non-Governmental Organization in June 1999- June 2000 as a Research Assistant. Following which she worked at the Bureau of Public Enterprise [BPE], the agency charged with the implementation of the privatisation programme of the Federal Republic of Nigeria. She was then hired by the United Nations Development Programme [UNDP] for the Federal Capital Territory Administration [FCTA], Abuja as a Special Assistant to the Minister on Project Implementation. She later she worked as Director of Strategy of the Good Governance Group, a Non-Governmental Organisation. 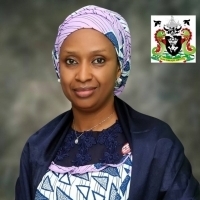 In July 2015, she was appointed as the Chief of Staff to the Kaduna State Governor, a position she held until her appointment on July 11th 2016 as the Managing Director Nigerian Ports Authority. She was also appointed by President Muhammadu Buhari to serve as a Member of the Presidential Advisory Committee on Anti-Corruption. She was named by Financial Times [FT] amongst the most influential women of 2014, was named amongst CNN’s most inspiring woman of 2014 and also named by Ebony Magazine amongst the 2014, 100 most influential black women in the world.